"What should I do if I broke my tooth?" Having a broken tooth may or may not be painful. If it hurts you need to get it fixed as soon as possible.Sometimes broken teeth are fractured right down into the roots. This can be extremely painful, and it will stay that way for a while. It is best to have the dentist look at the tooth and take an x-ray to see how deep the fracture goes. Get it taken care of so you don't have to suffer any longer than necessary. If the tooth doesn't hurt it still needs to be fixed. A broken tooth means some part of the tooth is gone, and the inner part of the tooth is exposed to whatever you put in your mouth. That inner part is softer than the enamel. If you don't get it fixed the inner part of the tooth will become a cavity (decayed) and THEN it will hurt. It needs to be covered up. This patient was eating popcorn and had an un-popped kernal break his tooth. This tooth was broken catastrophically and had to be extracted. A bone preservation graft was placed at the time of the extraction to help maintain good bone in the site. Later a dental implant was placed and restored to replace the missing tooth. Something to note is the amount of bone that was lost in the tooth space BEHIND this tooth. That site was NOT grafted and placing a dental implant in that site now becomes much more complex. If you find yourself with a broken tooth try not to chew in that area until you can get in to see a dentist. If you bite down just right the crack will grow, and it might grow in the wrong direction. Some broken teeth break into the nerve and require a root canal and a crown, others break down below the bone level and require extracton. This nice young lady was hit in the front tooth and fractured off half of the incisal edge. The tooth was very sensitive to cold due to the exposed underlying tooth structure. 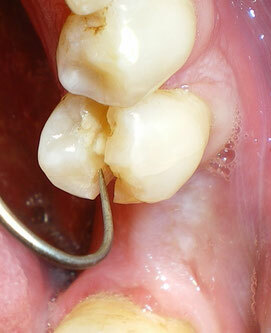 Initially a composite filling was bonded in place. In time a crown or veneer will need to be placed to achieve the most optimal esthetic result. If you find yourself with a broken front tooth like this (especially common while participating in sports) don't worry about bringing in the lost piece. If you can find it quickly then bring it. Most of the time it cannot be bonded back on anyway. These can be painful, and often times they do end up needing a root canal to stop the tooth from hurting. In this case she did not need a root canal.